Oklahoma State Flags honor more than 60 groups of Native Americans and their ancestors. The blue field of the flag is inspired by a flag carried by Choctaw soldiers during the civil war. The center shield is the battle shield of an Osage warriormade of buffalo hide and decorated with eagle feather. Show the legacy of your state with Oklahoma Flags from Tuff Flags. 100% made in USA, these flags carry 6 month guarantee on construction and are available in all standard sizes. 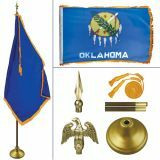 Our commercial grade flags are designed to look great for a long time, which makes it a perfect choice as gifts, collectibles or flag display items. Our Oklahoma Flags are available in various popular sizes and 2 fabric choices of nylon and polyester to match the diverse flag presentation needs. If you are looking for a light weight and quick dry flag that will present a dramatic spectacle, nylon flags will be a good choice whereas polyester flags are more suited for high wind areas and can be safely used as a daily flag even in the most challenging outdoor conditions. Finished with grommets and headings our flags are reinforced with lock stitching, which makes it durable and attractive. The colorfast Dupont inks will make the flags look brilliant for a very long time. Choose from indoor flags, outdoor flags and indoor flag kit. 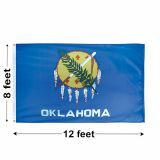 Shop from our complete line of Oklahoma Flags at the best rates. Need help? Call our toll free number (888) 287-3524 or email at customercare@tuffflags.com and we can walk you through the ordering process.